Out of all the trail skills I work with riders on Cornering remains one of the hardest to pick up. The funny thing is, it isn’t because of a lack of “knowing” what to do, since there are a lot of great videos, books and camps that can teach you the technique behind it. Instead of focusing on the techniques behind cornering, they need to focus on the movements behind the techniques. A lot of times it isn’t a technique issue that is holding riders back as much as it is a movement issue. If you can’t get your hips to move like you need them to then no amount of “knowledge” can help you.. I know this because I was one of those riders. Despite knowing what to do from a technique standpoint my real breakthrough with cornering happened when I started focusing on 5 movement skills to help stay balanced and better able to execute my technique. 1) Get your seat down and use a mid-foot position on your pedals. Cornering is all about getting your hips moving around the bike and if your seat is in the way it can be a lot tougher to do. In fact, if you try to learn with your seat up you’ll most likely pick up bad habits. Also, you’ll need to be able to drop your heels so you can weight the outside foot and “carve” the corner which requires a more mid-foot position on the pedals. I recommend flat pedals since they naturally put you in this position but if you run clipless then make sure you don’t have the cleat set under the ball of the foot as this will throw your weight too far forward and make it harder to use your as hips effectively. 2) Be able to ride switch-foot so you can enter a corner with the outside leg to the back. This will let you drop your heel and carve the corner better by giving you a better platform to laterally hinge the hips from. Even though you can get away with either foot being forward entering a corner you will be more balanced and better able to execute your technique if you can get your outside foot back. 3) Set your hips before entering a corner by weighting the outside foot. If you enter a corner balanced it is too late, you’re going to be playing catch-up with your balance points through the corner. By shifting your weight and entering the corner with you hips set and ready to shift you can set your edge faster and more easily dictate the balance points. 4) Use counter-pressure to lean the bike over and your vision to pull you through the corner. When entering a corner you want to lean the bike over by pushing with the inside arm and look through the corner to make sure you ride smoothly through it. Counter-pressure is critical to maintaining good traction and since you go where you look your vision is your ultimate guide. 5) When all else fails focus on shifting the hips laterally and not squatting down or leaning over with the shoulders. When you are doing it right you’ll feel your ribs laying down one by one on top of your inside thigh. Your hips are the driving force behind cornering. When they are moving well then you will corner well, if you’re not cornering well then odds are they are not moving well. Focus on improving how you use them to stay balanced in corners and all the other parts of the technique will come much easier. The take home message is that unless you can move your hips laterally like I show in that video you’ll struggle to apply good cornering technique, which is why you need to use targeted strength and mobility training to improve that movement. Once you can do it better off the bike you’ll be able to do it much better on the bike. If you have any questions about these 5 Movement Tips please post a comment below and if you liked these tips please click one of the Like or Share buttons below to help me spread the word. Why I train barefoot…and you should too. Really appreciate the work you put into these items – look forward to them and they have greatly improved my riding. At what point in your sequence do you drop the outside pedal? Good question but here is the thing – you never “drop your outside pedal” as much as you shift your hips to the side and causes your outside pedal to drop. You can drop the outside pedal and not shift the hips, which misses the point of dropping the outside pedal. Shift your hips and let that heel drop as it need to in order to accommodate the hip shift rather than focusing on the outside pedal itself. With that said, you will start to shift your hips/ drop the outside pedal after you enter the corner. This is why you want to pre-shift a bit before you get into the corner so your ready to start shifting once you get there. I liked that post. I tried doing it off the bike when doing some random exercises but you took it to another level! Good read. I think yoj should have mentioned bike fit here, wide bars + short stem 😉 Point 2) I watched lots and lots of videos of top riders riding at DH World Cups. I did it after reading some of your post about symmetry. Greg Minnaar and Sam Hill in particular. They rarely shift their usual leading foot, if they do it happens before fast flat corners when they have lots of time to prepare. but I’d call it no. Point 3) is a bit messy for me. It is definitely better to weigh your outside foot than inside one when in the corner, but it can be misinterpreted and someone (like my cousin) may weigh the outside foot alteady before entering the corner and that is a bad thing, messing up your balance and range of mobility. I’d say ride with pedals leveled and learn to drop the outside foot after you begun turning. After practice you will learn to use that loading of the bike to generate grip, and exit the corner with more control. The best cornering drill one can get is pumping the flat ground, more rigid bike, the better. Fully is harder to pump but it gives a false sense of doing it right. Anyways, I always enjoy your translations of body movements on gym to what we do on trail. I have a similar question to WAKi’s points #2 & #3 above. Regarding changing the lead foot depending on left vs right corner. There was an instructional cornering video by Fluid Ride on pinkbike not too long ago. The instructor advises: stay in your strong foot position while cornering. Don’t alternate the lead foot. Shift weight by “dipping” the outside foot. Instead of weighting the outside foot before you enter the corner you actively load the outside pedal as you go through the corner increasing pressure so that the pedal is dipped to its lowest point at the apex of the turn. The outside crank may or may not get to 6 o’clock depending on the particular characteristics of the corner. He advises staying away from 6 o’clock because it puts you at the end of your rope as far as range of motion goes. The logic is that if you start to lose traction and you are already at 6 o’clock you cant chase your bike with the outside foot to apply more pressure and regain traction. As WAKi mentioned above, the instructor in the video states that this dipping approach seems to be the technique used by many pros. Anyways, would love to get your thoughts on the pros/cons of this approach to cornering. Thanks! With all due respect to them – and I haven’t seen the video – but that seems to be a perfect example of misinterpreting the movement behind the technique. First, I absolutely guarantee that it is easier and more effective to switch your lead foot entering a corner so that your outside foot is back. It is simple functional movement – your foot being back allows you to shift the hips back and laterally more effectively, period. Try it and you’ll see that you can hinge your hips back and laterally much easier to the side with the foot back. In fact, you’ll tip over to the side when doing it to the lead leg side if you really shift your hips back and laterally. This proves that you have better balance for that movement pattern from that stance. Even Waki noticed that Sam Hill and Greg Minnar shifted their lead foot when they had the time. His take-away was that since they don’t do it that much then it must not be important. Mine was that that if it didn’t matter then why would they would do it at all? At the speeds those guys are riding they don’t have the time to switch their feet according to the every corner and they have a foot they feel more stable riding forward with, which is why they don’t do it all the time. But they do do it when they can because they instinctively know that it allows them to better carve a corner. You’ll always have a stance you feel more comfortable with and when things get crazy you’ll want to go to it but that doesn’t mean that you shouldn’t be able to use both stances to help you corner as efficiently as possible when you have the time. As far as the crank shifting thing, I’m looking at it completely different than they are. They are looking at dropping the crank as driving the hips but that is the wrong way to look at it. The hip shift should drive the cranks dropping and by focusing on the hips the cranks will go where they need to. I don’t advocate going all the way to the 6 o’clock position either but if your not just dropping the cranks and instead are focusing on the hips then that shouldn’t be an issue. Again, the problem is that you have people who don’t understand movement trying to interpret what they see the pros doing. Since they don’t understand the movements behind the techniques they teach the techniques themselves but they often get the real cause of the technique wrong. For example, shifting the hips causes the cranks to drop but if you don’t know that then all you see are the cranks dropping. You then then misinterpret what you are seeing as dropping of the cranks as what drives the technique. But if you start to teach “drop the cranks” instead of “shift the hips” then you can confuse a lot of people as to what is really going on. Hope this makes sense. The real test is to try it out for yourself and see. Spot on James, totally buy into your explanation of how people do what they see without understanding what they are actually seeing. Cornering is where I really want to see better improvements in my riding. At the moment I am improving generally in fitness, baseline strength, speed and pedal technique, but I can feel cornering getting left behind and it really shows when I am on the trail. Your posts (and training program) are definitely helping. Thanks. Hi James. Great video. Any chance you could compliment the 5 tips with actual riding footage to help us put things more into context? You can also see it when watching good riders corner – once you know what to look for you’ll start to see it more. The problem is that watching it doesn’t tell you how it should “feel”, which is what I am trying to explain in this post. Good post James. Once again you provided information that is both useful and timely for me. I just finished the 30 Day Standing Pedaling program, and it has changed the way I ride. I’m putting the seat down more, I’m hitting sections of trail faster than ever, and it is forcing me to focus on my cornering. I found myself instinctively shifting my hips back and squatting down in the corners, but thanks to you I now know that’s not the right approach. Thanks for posting this information before I had the chance to devolop some bad habits. Great post ,I’ve been a fan of the fluid ride guys (see above) and learned a lot from them, but some of it doesn’t add up. When watching the pro’s they don’t alway dip there pedals very much at all. When looking at your explanation for technique it is exactly what the pros do, thanks for your insight. I’ve had the same problem with things I hear from technical skills coaches not adding up on the trail. Glad this helped. …how about videos of actual biking? riding road bikes. Your tips are great and are helpful will I figure out what I’m going to be when I grow up! Awesome, glad they are helping you out! Wow, I’ve been implementing the outside leg to the back technique and man does that change things a lot. It felt better even with my cleats in their normal position, but now I have moved them to a more mid foot position and am able to run corners with so much more confidience. I think this comes from the fact that the position is so much more balanced. And one advantage that I just realised is that with your inside foot forward if your front wheel slides out your foot is right ready to plant on the ground. Double bonus. Thanks James for your out of the box thinking on this. Love your work. Glad it worked for you as well, this is one of those tips that I don’t know why it isn’t more popular. I hadn’t thought about the inside foot being easier to put down if you slide out but now that you’ve mention it that makes sense and it is something I’ve experienced. Great insight. I’m a bit shocked that having the martial arts background that you do, that you aren’t all about being on the balls of your feet, or just slightly back from them. I come from a moto background, so that may be part of it. Not being on the balls of your feet in moto can have severe consequences if you have big feet. Regardless, being on the balls of your feet doesn’t have to be an exaggerated heels up affair, it just means that is where your weight is centered. There are a lot of major sports that teach balls of the feet for not only balance reasons, but for responsive movement as well. Being planted on the midfoot you’re well, just that, planted. Seems to me from the trying the midfoot thing that dropping your heels and driving through your pedals is also easier from the balls of the feet, and feels completely unnatural from the mid foot position due to the limited ankle ROM you’ve now created by having your foot so far forward. But, like all things, YMMV. The problem is that having your weight shifted towards the balls of your feet with some weight still on the heels (like you do in other sports) is not the same thing as having your heels suspended in space with no support under them (which is what happens on your pedals). It is like comparing apples and oranges. Being balanced on the balls of your feet with no support under you heels is like trying to do a set of swings balanced on the balls of your feet or tip toeing around when getting ready for a take down in wrestling or BJJ. Neither would work and you’ll see that having some weight on your heels is needed even in these sports people point to as reasons for us to be on the balls of our feet. Mountain Biking is a unique sport because you don’t actually push your foot off of the pedals and this changes how the foot wants to act and react. This is why you don’t do squats and deadlifts on your toes. The foot acts differently, meaning that the mid-foot position is better for some things and pushing through the ball of the foot is better for others. There is a problem with coaches who don’t understand this fact forcing people to use the wrong foot action. Lastly, when you shift too much weight to the balls of the feet you unbalance the feet, which makes it harder to move and react. This is why you look for someone shifting too much weight forward – or backward – when looking for a takedown. Once they commit to much weight forward they can no longer use the hips as well, which makes them sitting ducks. Like my wrestling friend told me when I was talking to him about it “you can’t change levels when you are balanced on the balls of your feet”. And since changing levels is important for piloting your mountain bike, doing something that makes it harder isn’t best. I’d challenge anyone to find a picture of an athlete in another sport balanced on the balls of their feet when they are ready for action. Even a soccer goalie bouncing around on the balls of his feet before a penalty shot will settle his feet to get some weight on the heels right before the shot so he can change levels and react. We keep throwing this example out there but it isn’t valid – you won’t find any athletes in any other sport balancing on the balls if their feet all of the time. Oh, and you don’t want to “drop your heels”. You want to apply pressure to the heels as you shift your hips back and that pressure increase/ weight shift will cause the heels to drop but just dropping the heels actually takes away the body’s ability to apply pressure as needed. A mid-foot position on a pedal like the Catalyst Pedal that supports both ends of the arch will allow you to shift your weight to the heels – or balls of the feet – without having to be either all the way forward or all the way back. Regarding the counter pressure. How much pressure, if I try muscle it I feel like I lose being relaxed. 1) Do I apply the pressure perpendicular into the bar or 2) or more in the direction of the end of the bar. Also is the counter presure guiding the direction of the bike or assisting front wheel traction? Moving my hips laterally has transformed my turning capabilities.. some drills that have really helped drive this point home are the Stick windmill, KB windmill and the naked windmill. When I first started doing these drills, I came to the realization that I was not very flexible in these area. Working on my flexibility in the gym, and taking those movements to the trail have made me a better rider.. I am still a bit confused about dropping the heel on the outside leg… ? I taught snowboarding for 12 years, so I do understand the difference between ‘weight’ and pressure, Weight and pressure are two different things.. I can rail (carve) turns now because I set those hips, and apply PRESSURE to the outside leg before the turn…, it works !! I think that the confusion is that you want to apply pressure with the heel into the pedals – like you do when carving a turn on skis – and this will cause the heel to drop. The more pressure, the more the heel drops. So you don’t want to just “drop the heel” but instead do what you are describing and letting the heel drop happen. 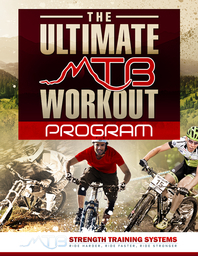 a while back you shared a session which I think was tailored for over 40’s trail riders. Something you said there really dialled my cornering, even though I’d been following your “displace the hips sideways” thing all along – it was a cue that works to start the whole movement. Easy to remember too. You said to drop the inside shoulder, (the shoulder inside the turn). Man that works so well, I was going off the inside of corners I’d previously found hard to nail – I push the shoulder down and without another thought, the hips and feet just do their thing exactly right. No need to think about counter steering either, it just happens. Did you mention it here? If so, I missed that. So, here’s my request – I’d love to see a video of you on a bike demonstrating that push the shoulder down cue / technique. I bet that would get some heavy hits on youtube or vimeo. Can you comment on bike lean versus body lean during cornering? In other words is it better to lean the bike more the than body, body more than the bike or to try to lean only the bike and not the body. Even if lean is not a point to focus on what would the bike to body lean ratio look like when the tips you have laid out in your article are done correctly? Also, do any of the cornering tips change when comparing flat corners to bermed corners? Thanks!